"Thank you guys you such make the day... The delivery was delivered on exact time of celebration. Thank you guys keep it up." "Product was delivered as promised. Wonderful experience!" Soft and mushy bears are perfect gifts for Valentine’s Day and birthdays. 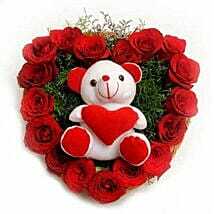 If you have a daughter or a beloved, and you are probably going to miss her birthday this year, send flowers with teddy bear online in Delhi. 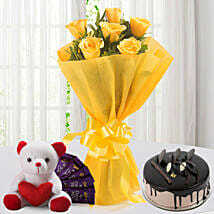 Pick cute flower arrangements from this section to gift it to your sweetheart for her birthday. 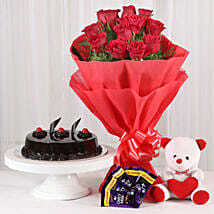 Make her feel closer to you by sending flowers and soft toys to Delhi anytime and from anywhere. It is a simple yet elegant gifting option. Easy on the wallet but big on emotions, our soft toys and teddy online are known to give love stories their wonderful moments. Apart from teddies, you can send tiger cubs, Nemo, giraffes and other lovable animal figures. Disney characters and other notable figures are also available in our exclusive range of soft toys.We undertake gift delivery in delhi in 2 hours. Make an order for gift delivery in New Delhi with us and experience our quick and reliable service. 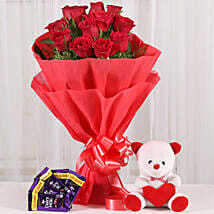 If you are about to miss your date, just go online and book flowers with teddy online delivery in Delhi. Our delivery will make sure, we reach before you.Don't take our word for it—try us out. You'll never go anywhere else for your gifting needs.We offer amazing discounts on Teddy Bears and Soft Toys Online for thisfestive season. We give you an opportunity to add complementary gift items to your teddy collection. 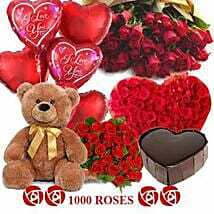 Stamp your love on the chocolates and flowers with teddy online delivery in Delhi. Add dazzle to your gift package with earrings, cushion covers, perfumes and tag lockets. For every gift you book, there is something special waiting for you. Hurry!